We've been casually looking for a house for the past 2 years since we've been married. Each weekend, we've been making a list of the open houses in our desired neighborhoods and checking out what was on the market. The Sunday before Halloween, we had only 3 houses on our list. On our short drive from one to the next, we happened to see an "open house" sign on the side of a street we hadn't had on our list. We decided to drive down to check it out. After waiting for some kids to move their hockey net out of the street, we pulled up to the house, walked in, and immediately knew we were home. We called the owners that night to schedule another showing, and returned on Halloween night to look one more time. We called that evening with an offer, and after one counter, we settled on a price. Since then, we've signed the contract and had the inspection, and now we just wait until January when we can finally move into our dream home. In the midst of those crazy days we've had, I wanted some quick meals, since we were running from appointment to appointment. I've had this flagged from How Sweet It Is, so we decided to give it a go. Talk about a quick meal! I altered it a bit, omitting the chicken and using jarred red peppers instead of roasting my own, but I think that added to the ease of this recipe. My modifications are reflected in the recipe below. Bring a pot of water to a boil. Cook the pasta according to package directions. In a skillet, heat 1 tablespoon of oil over medium heat. Add the onions and cook until they are translucent and begin to caramelize. Meanwhile, in the bowl of a food processor, add the peppers, garlic, parmesan cheese, basil, salt, and pepper. Blend until pureed, then stream in 3-4 tablespoons of oil so that the mixture comes together. 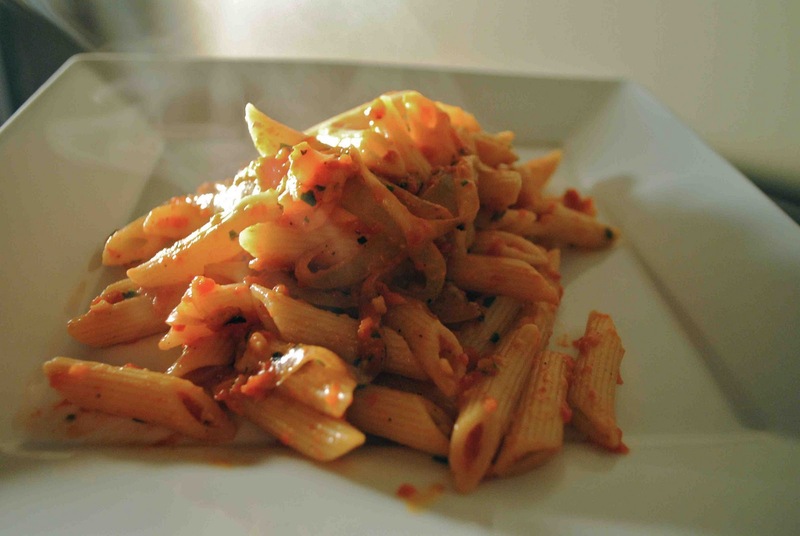 In a large bowl, combine the penne and onions. Add the red pepper sauce and toss to coat. Serve with additional parmesan cheese and a few basil leaves, if desired.